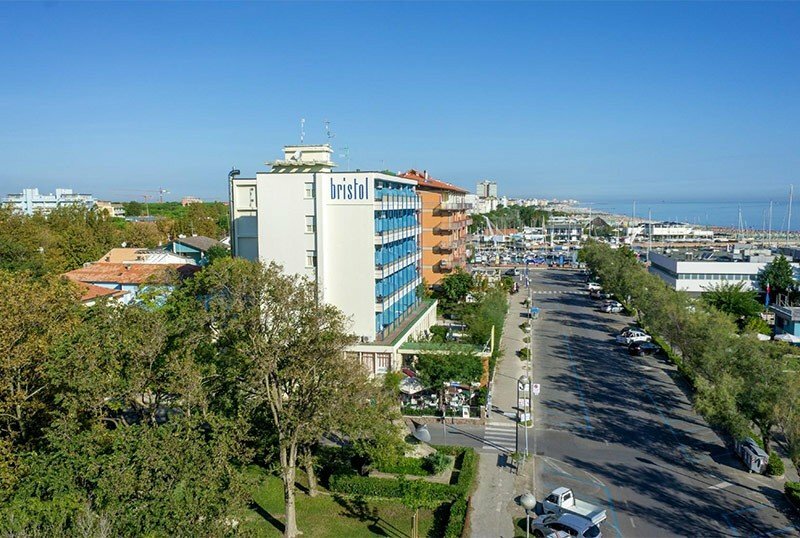 Centrally located on the Cervia seafront, the Bristol Hotel is a three-star superior beachfront hotel that has all the facilities for an All Inclusive vacation, including: parking, WI-FI connection, private beach with mini club and recently renovated rooms . Pets Allowed. The hotel is located in front of the beach, on the seafront road, a few minutes walk from the canal and the historic city center. All the rooms have been recently renovated and have air conditioning, heating, 20 "LCD TV with digital terrestrial, safe, Wi-FI connection, minibar and private bathroom with shower or bathtub, hairdryer and magnifying mirror. COMFORT: positioned on the back, quieter, with a small French balcony. SUPERIOR: in a lateral position, with a balcony overlooking the sea. EXECUTIVE: seafront, with balcony or terrace. FAMILIES: on request connecting rooms are available. Garden, open-air porch, lift, reading room with daily newspapers, pay laundry, free beach towel. Theme nights are organized. PARKING: uncovered available for all customers (not guarded). DOMESTIC ANIMALS: small pets are allowed with room sanitation supplement. BREAKFAST: buffet with sweet and savory food. Thanks to the formula Break brunch (extended breakfast), it is possible to use the buffet until 12. DINNER: Romagna and international cuisine, a la carte dinner with 4 first courses and 4 second courses with water at meals. In hotel: baby sitter and pediatrician (both on request and for a fee). At meals: table seats, baby menus, baby food, bottle warmers. On the beach: mini club and equipped playground area. The hotel has an agreement with the Sorriso bathroom, right in front of the hotel. It has playgrounds, mini club, WI-FI and much more. The prices of the price list are per person per day for a stay min. of 3 nights, in treatment of Half Board.